My Handbound Books - Bookbinding Blog: Happy Canada Day! FREE SHIPPING on all orders from my Etsy shop July 1st to 5th! Because I'm celebrating Canada's birthday and want to share with anybody who likes my books. Visit my Etsy shop online, at MyHandboundbooks.Etsy.com and all the shipping fees have been removed for Canada and USA customers. The rest of the world gets half price shipping! 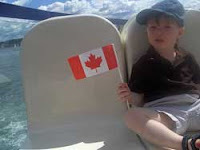 There is my kid, one year ago, celebrating Canada Day on a ferry ride in Halifax Harbour with his little paper flag. And here are some nice red and whites in my shop, Happy Canada Day! Thanks Carol - can't wait to see what you come up with when the bookbinding bug bites you next!